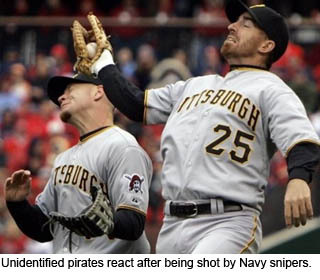 The U.S. stepped up its crackdown on international piracy today with a surprise assault at PNC Park in Pittsburgh. At least nine buccaneers were gunned down in the raid, which ended a tense standoff between the pirates and the New York Mets. The trouble began in the third inning, after the band of pirates, dressed in sinister black caps and armed with wooden clubs, seized a 2-1 lead. Leading off for the Mets the next inning, Carlos Beltran singled into left field. The buccaneer pitcher then tried to prevent Beltran from escaping first base. At first, the pitcher just glared at Beltran to keep him from running. Then he pretended to look away, but suddenly whipped around and threw the ball to the pirate first baseman. Navy snipers swiftly moved into position. "Beltran was in imminent danger of being picked off," said Vice Admiral Bill Gortney. "So, I gave orders to shoot." Seconds later, it was all over. The nine pirates lay dead on the field, Beltran was reunited with his teammates and the war on piracy moved on to Tampa Bay.